Following their two day meeting in mid-September, members of the U.S. Federal Reserve’s policy setting Federal Open Market Committee (FOMC) decided not to adjust the federal funds policy interest rate. 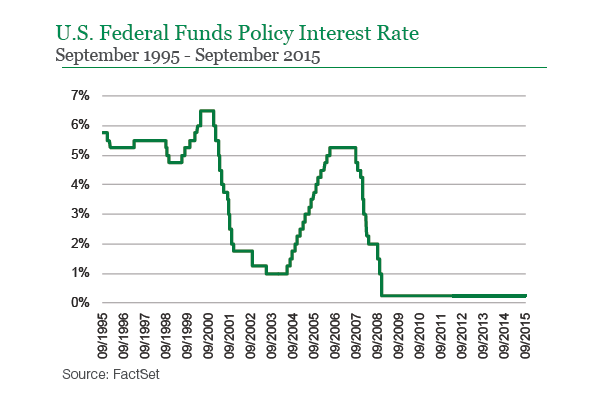 The rate will remain within the current 0% to 0.25% range, where it has been since December 2008. 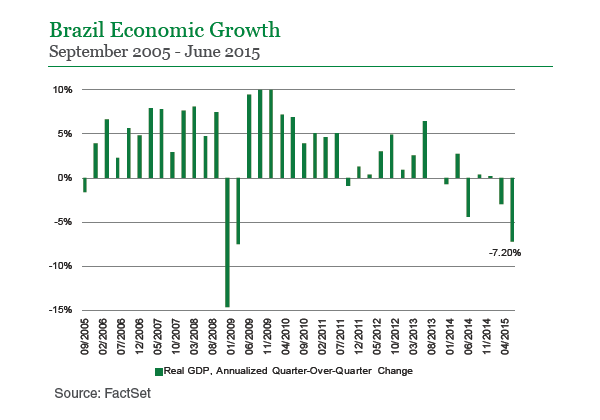 Second quarter growth in U.S. real GDP was again revised higher in the Bureau of Economic Analysis’ third estimate. The domestic economy is now estimated to have expanded at a healthy 3.9% annualized pace during the April through June period. Recall that the original estimate from late July showed 2.3% growth. 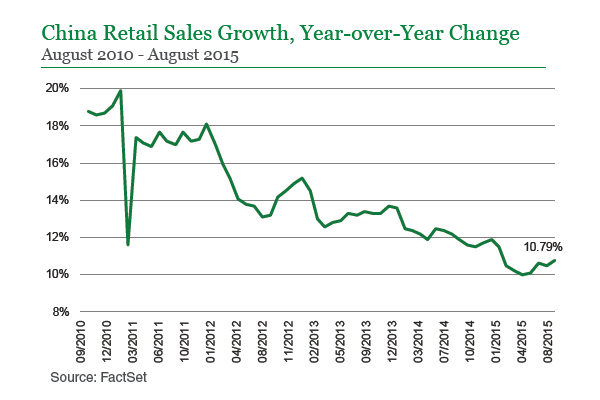 U.S. consumer confidence has rebounded from mid-summer lows over the past two months. Persistently low gasoline prices helped lift the present conditions index more than five points from August to September and moved the headline index reading to 103 from 101 in August. The Conference’s Board measure of consumer confidence touched 91 in July and was at 103.8 in January. 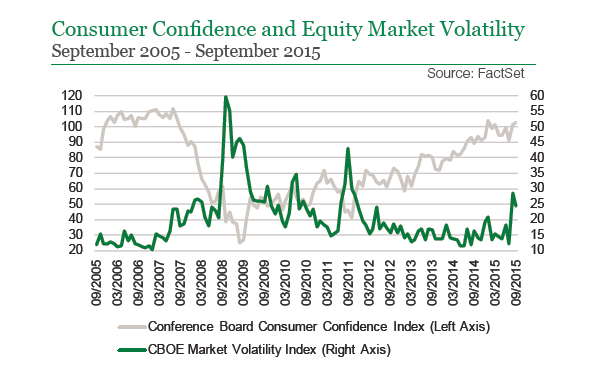 To the extent that financial markets remain volatile in the coming weeks, however, it would not be surprising if consumer confidence begins to retreat slightly once again. Recent spending figures also reflect the generally good mood of consumers in the current environment. Consumer spending rose 0.4% in August on a month-over-month basis. This followed similarly solid monthly advances of 0.3% and 0.4% in June and July, respectively. 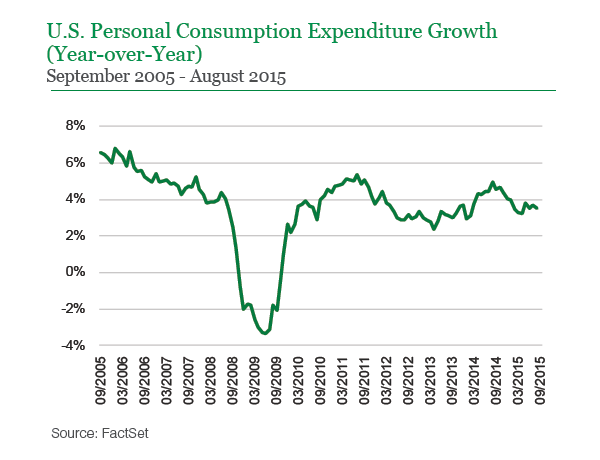 Year-over year, growth in consumer spending appears to be holding in the mid-3% range. The firmer labor market environment is a key factor likely lending support to consumer confidence and overall spending. Global investors continue to direct their attention toward China. While there are further signs of ongoing slowdown in Chinese investment, particularly in the manufacturing sector, we continue to observe strength in the Chinese service sector. This is significant given that the service sector is now the largest part of the Chinese economy and may soon account for more than 50% of Chinese GDP. Though the decline in investment is weighing on economic growth, we believe that the structural shift to an economy more reliant on service provision and domestic consumption is more stable than one reliant on investment and manufacturing. However, investors should expect economic growth to ultimately stabilize at a lower level over the long-term. The latest round of Greek elections have come and gone. Prime Minister Alexis Tsipras and his Syriza party secured a clear victory. The election results mean that the deal Tsipras and his team negotiated with creditors will move forward. In order to unlock much needed funding, the Greek government will need to implement sequential reforms. Given the contentious nature of some of the reforms that must be passed, and the new coalition government’s slim majority, policymakers are likely to experience some difficulties along the way. That being said, if the process ultimately leads to Greek debt being restructured and the aggregate level of debt falling, it would be a significant positive development. In all, we expect that political volatility will persist around reform deadlines, but the worst is likely behind us with regard to Greece potentially leaving the eurozone. In Brazil, following the recent release of a draft government budget that was received very negatively by outsiders, policymakers announced a series of measures aimed at closing the funding gap left in the original proposal. This is more evidence of Finance Minister Joaquim Levy doing what he can in the current troubled political environment, but he is fighting an uphill battle. While the development—along with the passage of a tax on the profits of financial firms —is modestly positive from the perspective of the government’s fiscal account, we do not believe that these moves signal any sort of inflection point in Brazilian politics. On the plus side, the latest data suggest that inflation could be leveling off. Uncertainty surrounding global economic growth and shifting expectations concerning the direction of central bank policies fueled a spike in global equity market volatility during August. Despite the recent market moves, valuations in the broad U.S. stock market remain generally elevated. That being said, we continue to see little evidence of excesses in the market or economy that would need to be unwound. Regarding investor sentiment, there remain signs of complacency in the market that we are monitoring closely. In this environment discernment and flexibility are critical. In portfolios geared toward investors that need capital growth, we took advantage of recent market weakness to initiate positions or increase exposure to fundamentally strong businesses that are not heavily reliant upon macroeconomic growth to drive sales and earnings. More specifically, we see value in businesses that we believe have control of their destiny and are taking share in large established markets or are creating new markets on their own. The goal is to identify companies trading at attractive valuations relative to their growth potential. For fixed income investors and investors with a shorter time horizon or current income needs, we continue to focus on opportunities we are seeing in investment-grade corporate bonds. A selective approach to the below investment-grade corporate space is helping us find value there as well, however opportunities are becoming more scarce as investors reach for yield. With regard to government debt, we continue to favor Agencies over Treasuries. In addition, we do not believe current yields in longer-term bonds are at levels to fully compensate for the risk that is present in today's interest rate environment and, as a result, our portfolios have a generally shorter duration than the benchmark. In our view, short-term and income-oriented investors should also explore equities that display stable fundamentals and are trading at attractive valuations. We believe companies that generate strong, stable cash flows and pay an attractive dividend could be compelling options for these types of investors in the current environment.